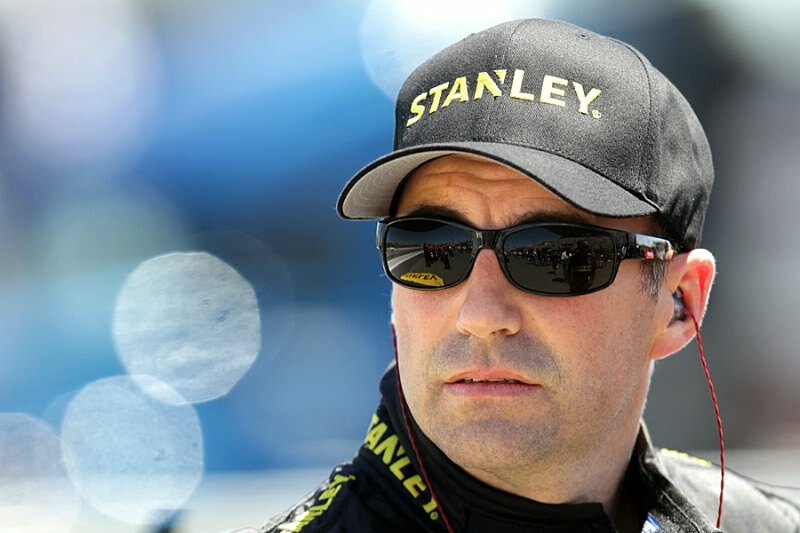 This whole NASCAR 101 stuff has got me thinking about things differently, including re-thinking this article I wrote a few months ago. In it I compared NASCAR’s new spoiler to the CoT spoiler and to the pre-CoT spoiler with a NASCAR Canadian Tire Series spoiler thrown in for good measure. 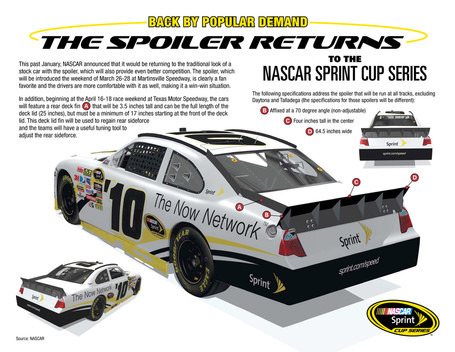 Well I’ve now included a NASCAR graphic about the spoiler for your info. If clicking on the graphic does not make it larger then click on the following web-based link to view the larger image. 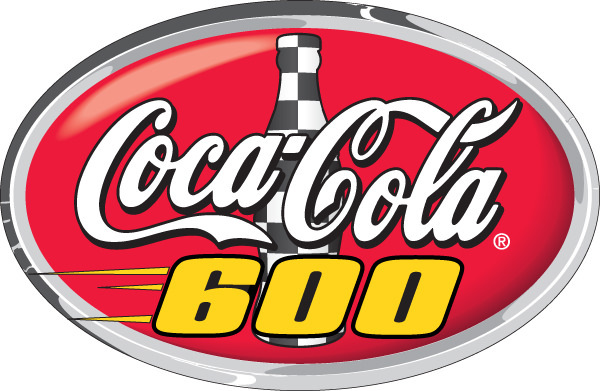 On Thursday in Concord, N.C., NASCAR announced a significant change to the NASCAR Sprint Cup Series’ new car, including replacing the wing currently mounted on the rear of the car with a spoiler. 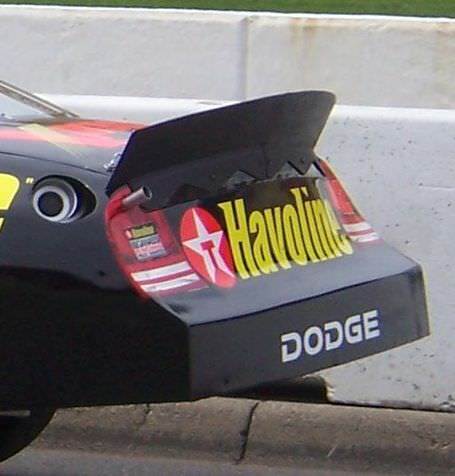 It looks like the braces offer up no chance for adjustment at all, which means every car will have the same angle of spoiler. 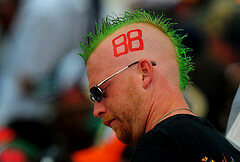 It also is flat across the top where as the old spoiler was concave in shape. Compare the above image with the old version of the spoiler below. 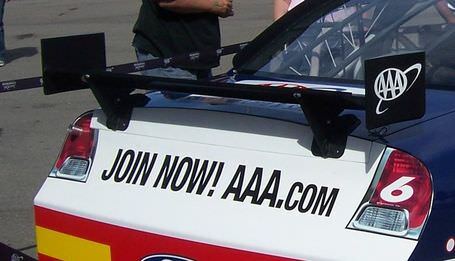 The spoiler of the #42 car driven by Juan Montoya at MIS Aug. 2007. Now compare the above spoiler pictures with the CoT’s spoiler pictured below. 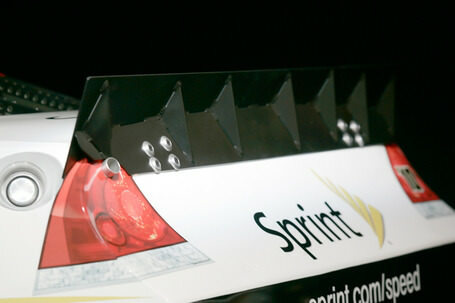 Rear spoiler of the #6 car driven by David Ragan at MIS in Aug of 2007. It is the absence of the side plates on the CoT’s rear wing in heavy traffic that concerns me about the rear spoiler. Listen I’m no areo-engineer but wouldn’t the absence of the side plates allow any car coming up and side drafting another car near its rear quarter take too much air off of the new spoiler causing it to lose down force making the car too loose; especially in the corners where the down force provided by the spoiler is much needed? I guess that is why they have put in the rear deck fin (see ‘A’ in the NASCAR Graphic) otherwise known as the shark fin by the drivers, but it is only on the driver’s side, what about the right side? Is it needed there? I don’t know but I’m sure we’ll find out as the year goes on. 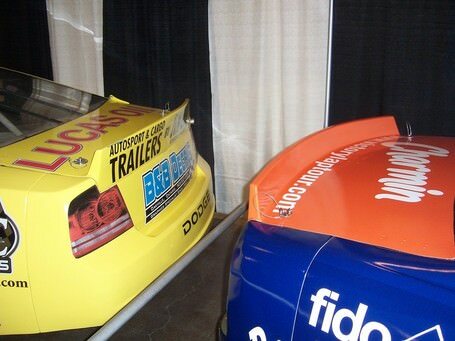 Oh and for another comparison here is a shot of the spoilers that are run in the NASCAR Canadian Tire Series. Note how similar they are to the proposed new one and the old one – kind of a combination of them both. Spoilers run in the NASCAR Canadian Tire Series taken at the 2010 Canandian Motorsports Expo.